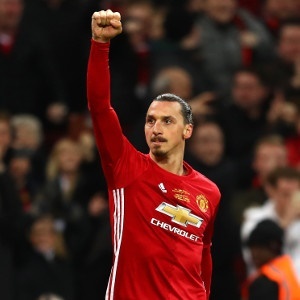 London - Swedish football great Zlatan Ibrahimovic says he will surprise many by performing better for Manchester United than he did before suffering a serious knee injury earlier this year. The 35-year-old veteran striker - who defied the critics in scoring 28 goals for United last season, including crucial goals in their Community Shield and League Cup victories - told 'Inside United' he had not let the ligament injury get him down. Ibrahimovic enjoys a good relationship with United manager Jose Mourinho, who maintained contact with him during his rehabilitation, and the Portuguese decided it was worth offering him a new one year contract last month. Mourinho believes Ibrahimovic will offer strong competition to Romelu Lukaku - the Swede could be back in action as early as November - for the striking role, even though the Belgian has begun impressively since his £75 million move from Everton. "I feel good," said Ibrahimovic. "I have trained every day since I had my knee operated on, there is no vacation. "It's a new challenge but I am strong mentally and when I focus on an objective nothing can stop me. "I will go through everything, it doesn't matter what's in my way, I will break everything to reach my goal. "When I come back to play football on the field I will be better than before. I am not coming back because I am the one I am, I am coming back to be a better version of the old one. Imagine how that will be!" Ibrahimovic, who missed United's Europa League final victory over Ajax due to his injury, said his natural impulsiveness would have had him back playing by now, but he had had to restrain himself. "If we talk specifically about the injury then I have never felt any pain, the only thing I have felt is a strange feeling in my movement that obviously showed something was wrong in the knee," he said. "Now we're building it up and it's getting stronger. "I feel good and I feel my movements are there. If it was up to me I would like to play football today but it doesn't work like that. "I need to have patience and that's the way we work. We are in no rush, when we are ready we will be ready. "When I am playing again I don't want any excuses that I was injured, or 'he just came back, this is his first game'. "No - I want to feel the same pressure I had before."